This new house for a young family replaces their previous 100-year-old home damaged beyond repair by the Christchurch earthquakes. After five years of living in a cold, broken home, they came to us with some very clear objectives. 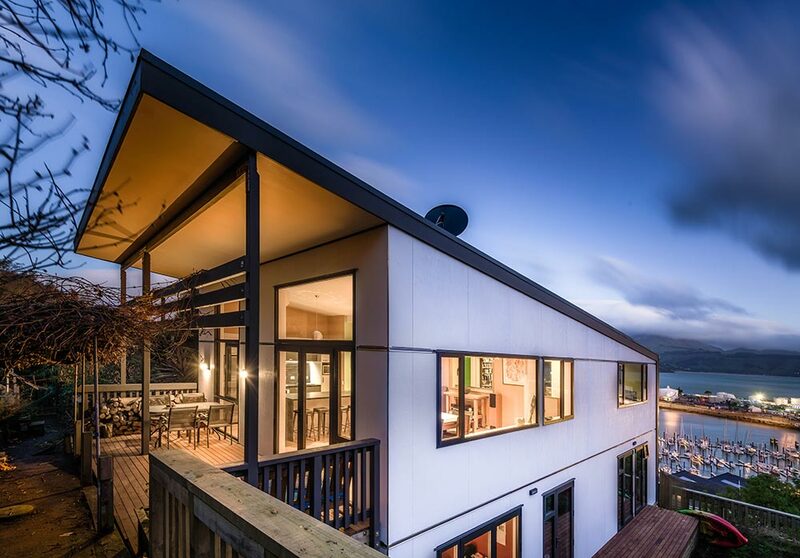 They wanted a warm, dry home, fully sealed from Lyttelton harbour's cold southerly winds, with spaces that maximised the sun on the south-facing site. The site is typical of Lyttelton in that the view is directly south. So prioritising the sun and the view was the challenge. Our first decision was to build two storeys and locate the main living spaces upstairs. Sun reaches these rooms earlier in the day, and stays for longer in the afternoon. We designed the top floor as a hybrid of open-plan and defined spaces. Walls, internal windows, and sliding doors mean the kitchen, dining, lounge, and study can be closed off or opened up to create one big space. This allows the stunning harbour views to be appreciated from anywhere in the upper living areas. It also means the presence of the morning sun can be seen and felt on the western side of the house, while the afternoon sun can be appreciated on the eastern side too. And, at night, rooms can be closed off and heated quickly to keep energy costs down. As a defence against the cold southerly blasts, we designed the south wall and roof as a folded element – it wraps over and down the wall to form a ‘shield’ to the wind. On the ground floor, we have located the bedrooms, bathroom, entrance, and a children's playroom. 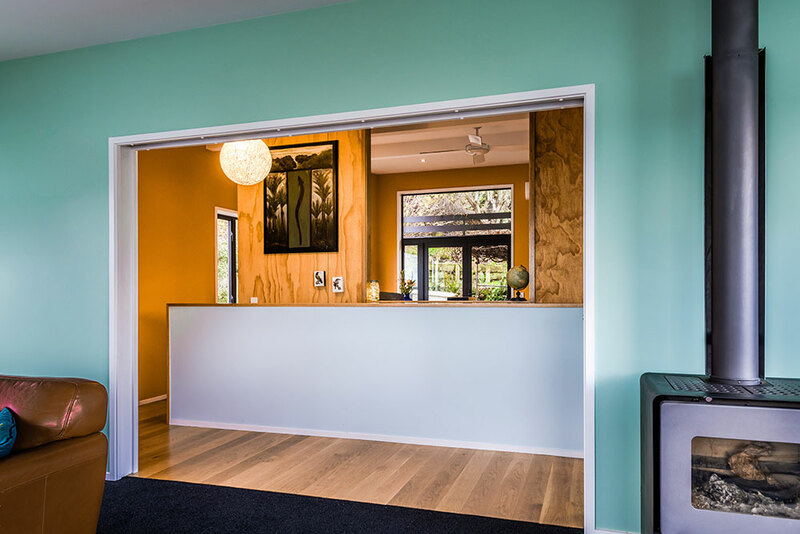 The playroom and entrance are open to each other; this makes each space feel larger, and allows sound to travel up the main staircase so the parents can listen to what is happening in the playroom downstairs. By building two-storey, we were able to create space for a new western garden and extend decks both sides to maximise access to morning and afternoon sunshine. The longer, narrow plan – compared with the original dwelling's square plan – also allows greater sun penetration into the house. And together with the draught-free, airtight construction, this new house is warm and dry, ready to capture the sun and magnificent harbour views all around. Simon listened and exceeded the brief, giving us a hill build that works in everyway for a family. The build opened up spaces to the section in ways that brought in new vistas and hidden nooks.